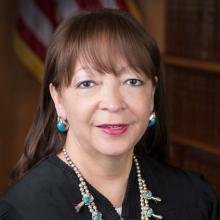 Christine M. Arguello is a federal judge on the United States District Court for the District of Colorado. Previously, she was a nominee to the U.S. Court of Appeals for the Tenth Circuit. Arguello earned a bachelor's degree from the University of Colorado at Boulder in 1977, and earned a law degree from Harvard Law School in 1980. She practiced at Valdes-Fauli, Cobb & Petry in Miami, Florida from 1980 until 1985, when she joined Holland & Hart as a senior associate and became partner in 1988. In 1991, Arguello joined the University of Kansas School of Law as an associate professor and was promoted to full professor in 1998. In 1999, Arguello joined the Colorado Attorney General's office as a Deputy Attorney General, working alongside then-Attorney General Ken Salazar from 1999 until 2002.